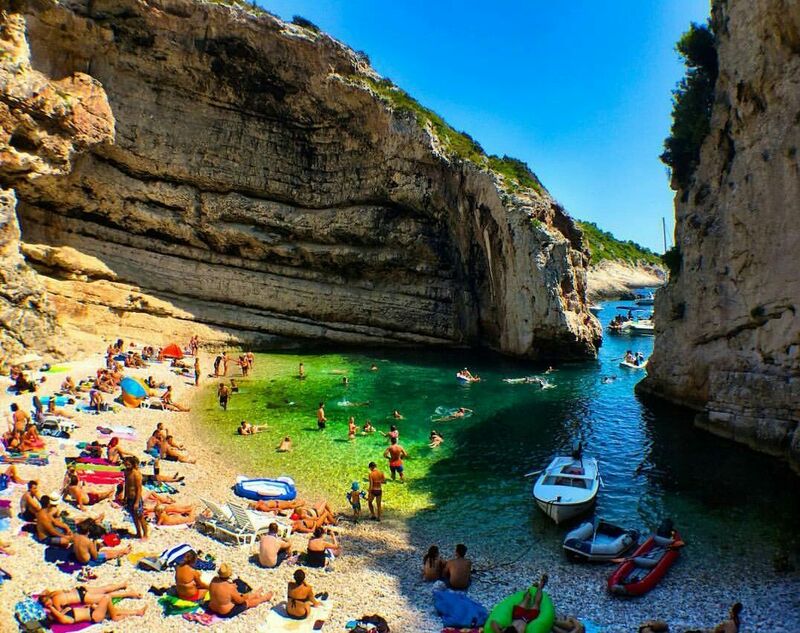 Stiniva bay and beach on Vis Island is undoubtedly one of the most picturesque beaches on the Vis island and in Croatia. This tiny shingle beach, situated at southern shores of the Island is framed by the iconic tall cliffs cut deep into the narrow bay. 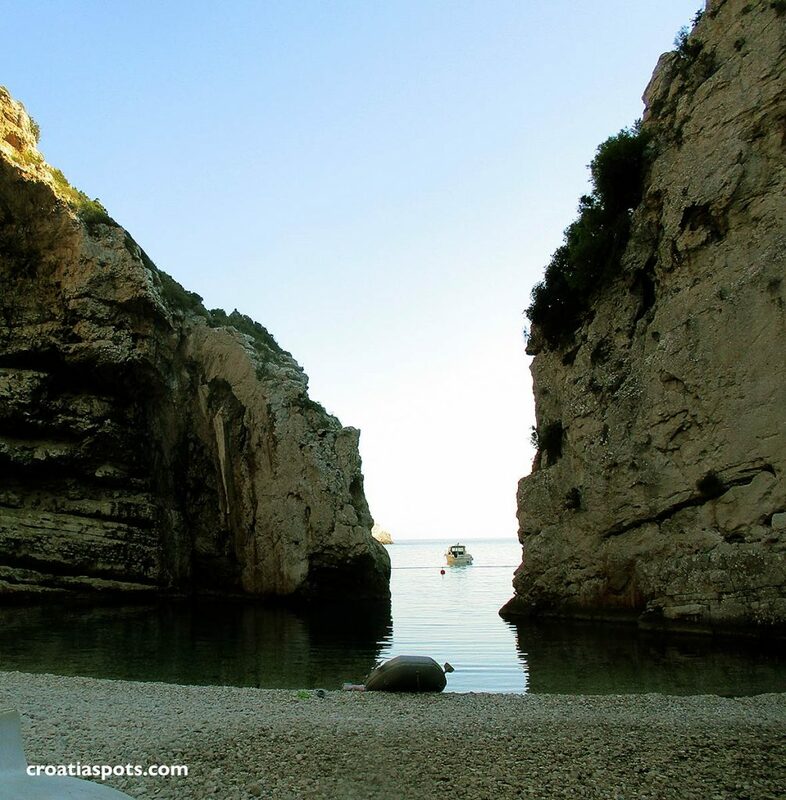 This unspoiled south coast of the island is opened to high seas where erosion formed this beautiful landscape. 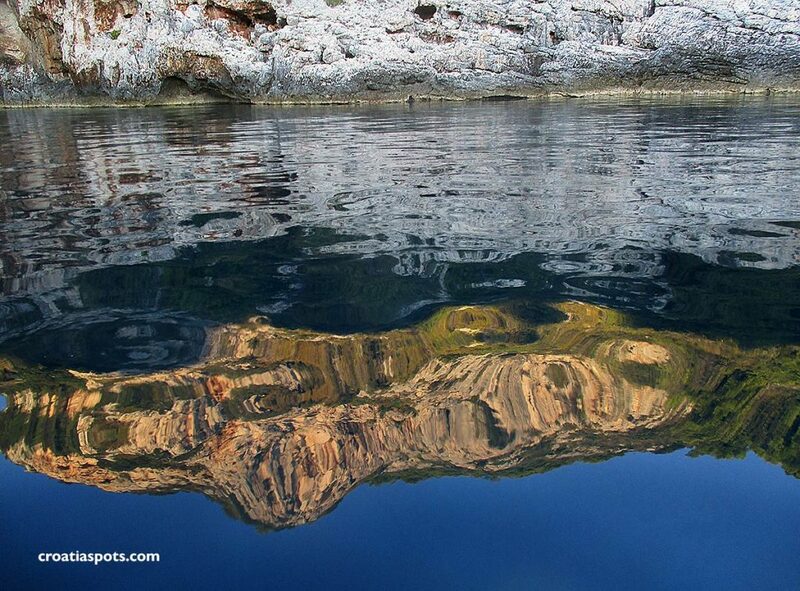 Since the 1960s the whole Stiniva bay is a protected significant landscape with the intention to preserve its original look and feel. We approached the bay from the sea entrance, that is a narrow passage of about 5 meters wide, not suitable for larger vessels. We used the small inflatable tender boat (see above photo). The sea here is clean, clear and pretty shallow with a lot of small shingles on the sea bottom. This is the result of centuries-long cliff erosion due to the fact that bay is completely opened to the open and rough seas and its waves. 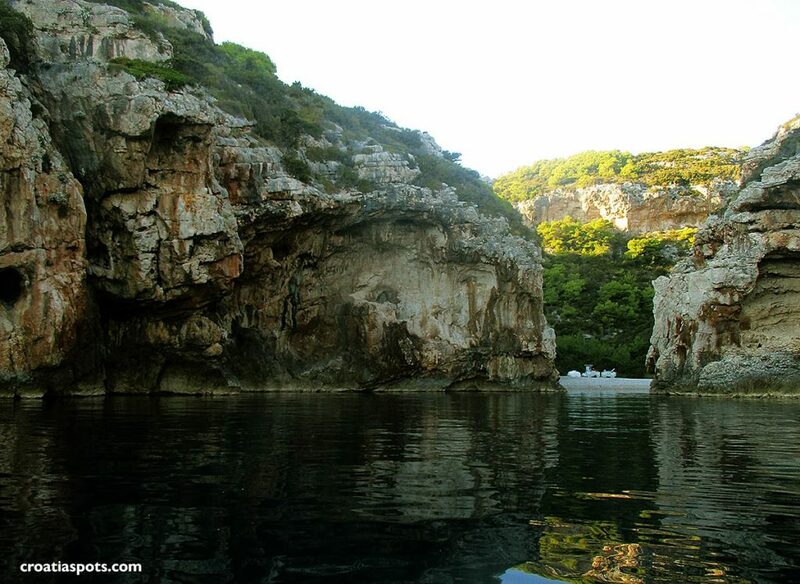 Once we passed the narrow cliff passage, inside the bay, the first impression we got was as we arrived in some kind of the Roman amphitheatre and the rock formations on cliffs look ideal for some rocks jumping. 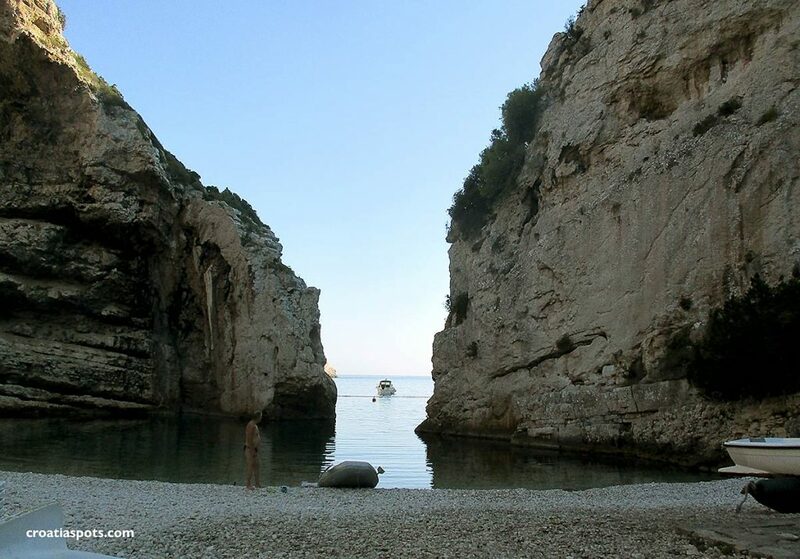 We were lucky and glad that we decided to visit this lovely bay out of the season. The bay was completely empty with no visitors in it. The local beach bar was already closed and the bay was so peaceful that we just stayed there until the dusk when we returned back to our boat. See also below photos that we took on the same occasion. Try to visit it out of season (May, June & September, October). That is exactly what we did and yes, we had the bay only for ourselves. If you can’t do it off-season, then get there in the early morning. In July and August, the sun rises as early as 4 am and if you get up early you can enjoy this lovely nature spot all by yourself before the crowds arrive. Leave the bay at about 11 am when it gets very busy. A late afternoon visit is also an option. If you arrive in the bay about 4:30 pm and stay until the dusk you will eventually have there sometime on your own. In July and August, the sun sets at about 8 pm so you would have about 2 hours left to enjoy the beach, its peace and tranquillity. Still, the best part of the day is early morning as it gives you much more time than late afternoon. Sign in the bay explaining why this is a protected (significant) landscape. 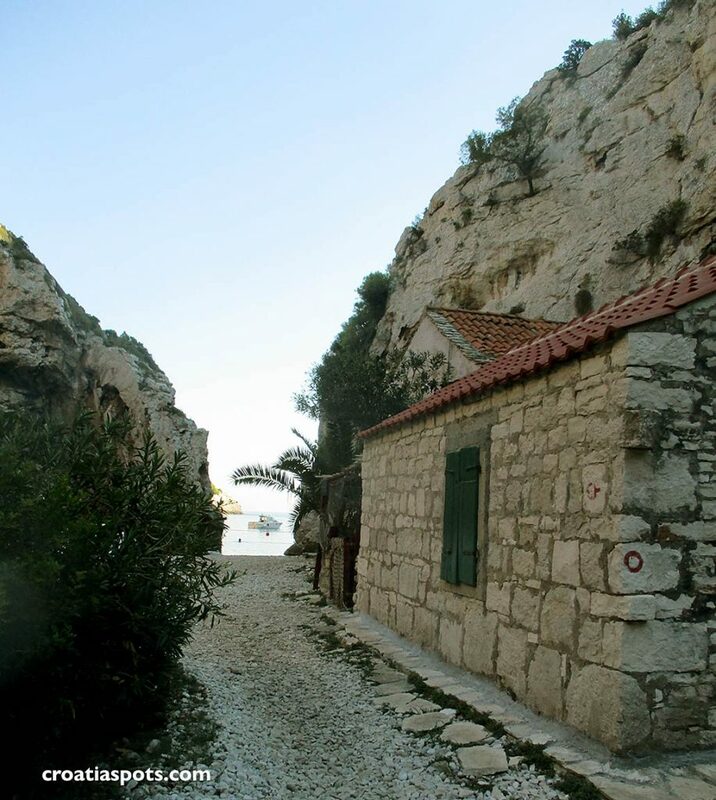 The bay is accessible from the sea as well as via a narrow and very steep hiking path that leads down the hill to the shores. You can not reach the bay with a car as there is no road leading to here. If you decide to walk here, bear in mind that in the middle of the day in the summers the sun rays are very strong and it gets very hot. Take a hat, sunblock and plenty of water. The best part of the day to hike to the bay is early morning or late afternoon. Get by car, scooter or bike to Žužec hamlet, one of 8 hamlets of Marine Zemlje village about 2 kilometres from Plisko polje village, and from there walk down the path to the bay – see the map below. 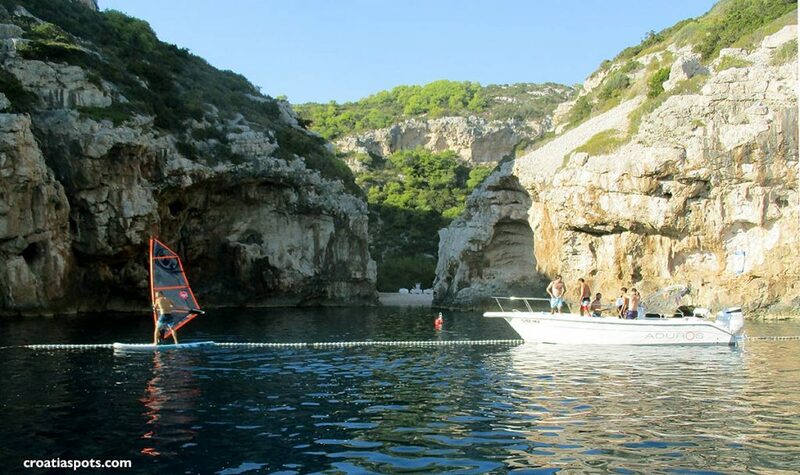 You can also rent a boat to sail there or kayak to paddle there. 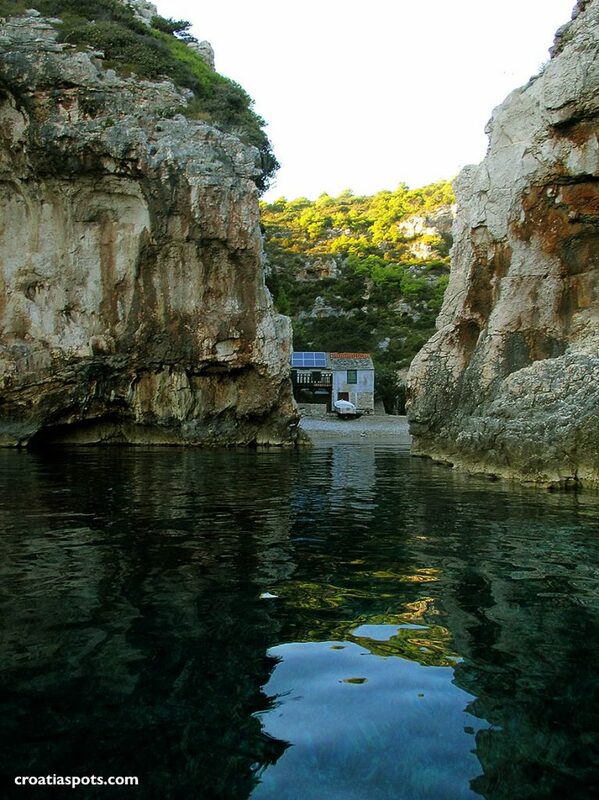 The nearest point to rent a boat or kayak is in Rukavac village on about 3.5 kilometres distance from the bay. From there it will take you about a good hour to paddle or row to the bay. Alternatively, you can rent a motorboat and get there much faster, in about 20 minutes. You can also book an organised tour of the bay. Its usually done by water taxi speedboats and getting there will last about 10 to 15 minutes. 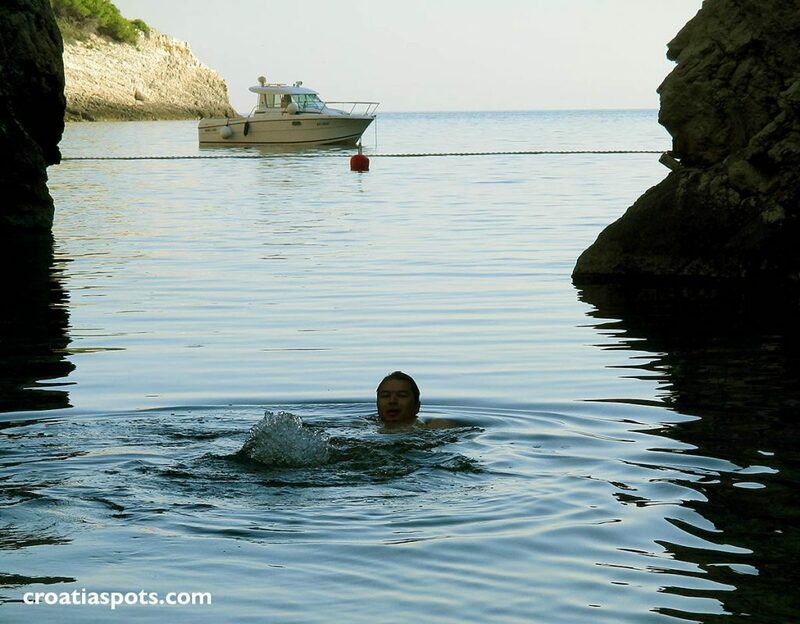 The tours are organised from most of the place on Vis island, especially from Komiza and Vis from where day excursion taxi boats will take you to the bay any time you wish. 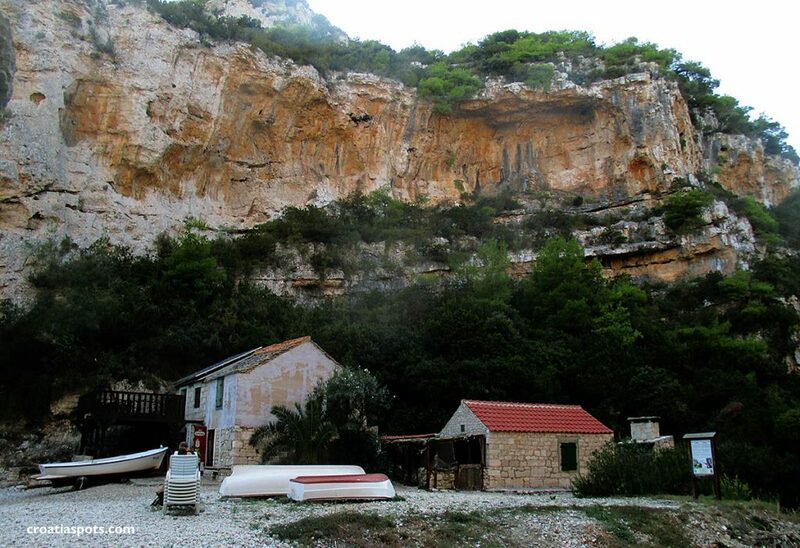 Take a car or taxi to Zuzec in Marine Zemlje village and from there walk to the bay. Alternatively, take a water taxi to reach it from the sea. If you intend to come here from these places, you first have to reach Vis Island (see the map here). Check available ferry sailing to the island on croatiferries.com website and start from there. Once on the island, follow the above advice. See below location map too. 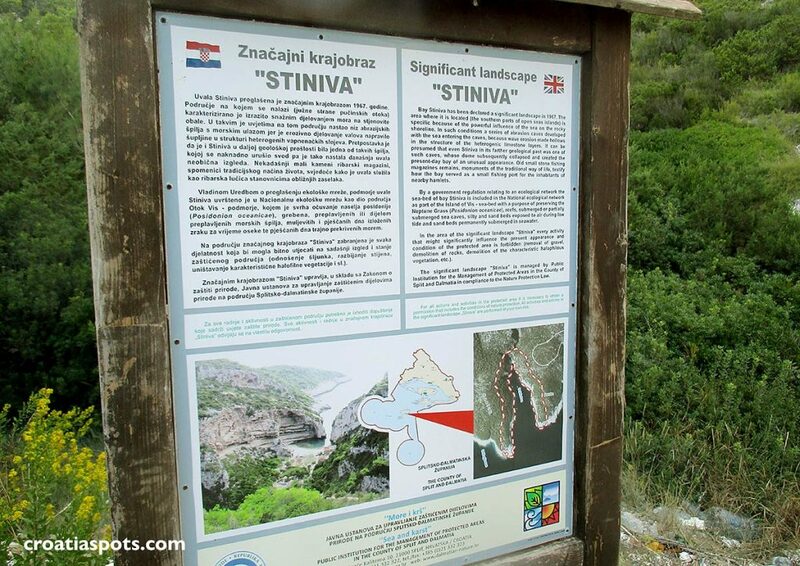 Although it says on the map that is is just 8 minutes walk, as the path is steep, it will take you about 20 minutes to reach the bay. The distance is about 450 meters.